SAINT MARYS – And All That Carry On…. 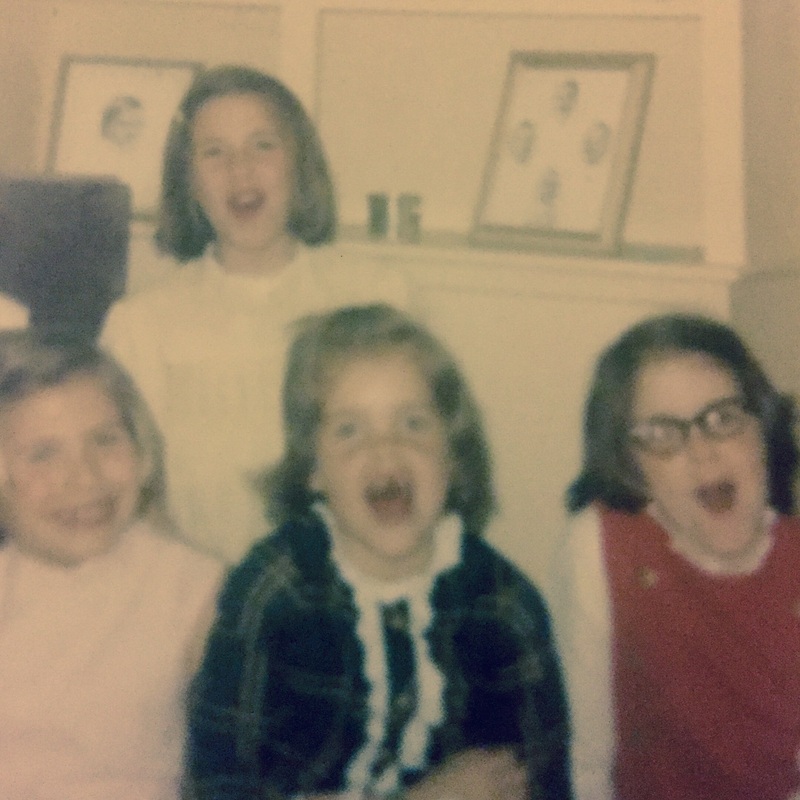 The Sisters of Mercy called us the Irish mafia; four little girls who hopped the bus at the corner of Wilson and Holbrook, laden with tin lunch boxes and backpacks. Kitty Hogan, Marguerite and Deirdre MacNamee, and me. The MacNamee’s and I would dash the two block to the bus stop , while Kitty was the lucky one. The bus stop was just outside her door. Our neighborhood was oak, maple, and willow tree-lined and while a fairly busy road swept through it, we had no chaperones to the stop. We ran and giggled our way to it without fear. My mother would listen patiently to whatever tales I brought home from school. Breathless with news, dropping backpack, coat and lunch box by the small eat-in table near the back door of our modest three bedroom colonial, my delivery of the day’s events came rapid fire. As I remember it, mom was always in the kitchen, ironing on a remarkable board which dropped from its decorative cupboard on the wall. I was a blabberer even then and would launch into the news of the day immediately upon entrance. She would tell me to slow down, that I sounded like I had marbles in my mouth. I might as well, for a girl from the Irish neighborhood the last names of most of my classmates were challenging and usually ended in vowels: Cicilline, Amoriggio D’Angelo, Romano. Their first names were nearly as daunting: Roberta, Angela, Ermelinda, Isabella. My classmates were mostly Italian with a sprinkling of Portuguese, all with olive tones, dark hair, thick eyebrows, and bodies, which by middle school, were way ahead of ours. Of course, we weren’t the only Irish girls at Saint Mary’s. Garrahy’s, Moran’s and Sullivans were there as well. I remember but one black girl during my nine years at Saint Mary’s Academy, Bayview. Here name was Perri Ann and she fascinated me. The Sisters at “Bayview” dubbed us the Irish Mafia, not that it was public knowledge, but rather an audible memory I have from a parent-teacher conference. Sr. Mary Florella, the gentle, elegant French teacher, shared it in a whisper to my mom. Rhode Island is a small state and the greater Providence area was an enclave of ethnic neighborhoods. The Italian girls from the big city itself, and towns to the north. We lived in East Providence, in a neighborhood called Rumford. I suppose it was a bold move in those days to send your freckled faced cherub to the all-girls Catholic school a bus ride away. The parish school was in walking distance. Bayview was a privilege. The school sat behind an endless wrought iron fence and spread across two buildings; one which housed grades K-6, the other 7-12. We started French in Kindergarten and could stay for piano lessons after school. Our jumpers were blue and gray and forever slipping off one shoulder or the other. The white Peter Pan collared cotton blouses couldn’t support them, particularly with our prepubescent chests. The knee socks were navy wool and itched, their elastic wore quickly and we were forever yanking them into obedience. It was the 1970’s, so no Latin, but ample obedience. I do not share the traumatic memories of Catholic school which plagued some of my peers. While I do remember Sister Lillian directing me to stand by her desk waste paper basket while the gum I had been caught with sat on my nose, I am no worse the wear for it. It was a transitional time in the church and the country and any minor fear of Sister Lillian was eased by the presence of the new wave of nuns; young woman who modified their habits to include vests and slacks. Sister Carol is my memory of change and she was warm, soft, and kind. Her acoustic guitar sat in its heavy black case in the corner of our classroom. She would play at rest time, exposing we protected Catholic girls to Joan Baez, Joni Mitchell and Bob Dylan. When she reminded us, “Jesus loves you”, I believed that she did, too. My personality as a child was well suited to all girls Catholic school. It was marked by enthusiasm, optimism and a sense of humor. I understood respect and while “chatty”, I was never accused of being “sassy”. The sisters, with the exception of Sister Lillian, loved my innocent energy. Years later, as I struggled through high school math, my mother would lament, “the nuns let your personality override your need to know math.” Indeed, The sisters cut me slack in arithmetic. They didn’t have the heart to undercut the enthusiasm I brought to those sweeping linoleum corridors. It somehow excused my inability to breakdown fractions. My limitations in math haunt me to this day. I do not specifically remember learning religion at “Bayview”, for the tenants of Catholicism were imbued throughout the school day. I have a complicated relationship with Catholicism, but it lives at my core regardless of the fact that I no longer practice it. As an adult with progressive leanings, I am discouraged by the church’s resolute positions on social issues. Regardless, when life is hard, I confess to conversations directed to the Blessed Mother, and a soaring Ave Maria still brings tears to my eyes. I feel the presence of my now gone mother and father daily, and I suppose that’s the lingering beauty of being part of a small posse of Irish girls who clamored down those tree-lined streets and climbed a bus to travel the miles to Saint Mary’s Academy, Bayview. What a wonderful look into your school days and friendships. Food for the soul. Oops! I love the Irish Mafia!